The Daily Beatle: John's Jumbo Gibson was never stolen? The two guitars in action on Late Scene Extra. There was a big discussion in the comments section of this blog post about whether or not John Lennon's 1962 "Jumbo" J160E Gibson guitar rightfully belongs to the current owner of the instrument. As you know, Lennon and Harrison had one of these each, and at some point George ended up with Lennon's guitar. Peter Hodgson has now tipped us off that the guitar may never have been stolen in the first place! 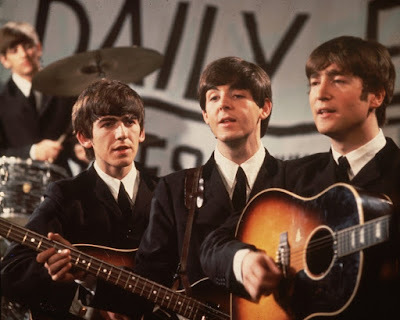 For the mimed performances of "I Want To Hold Your Hand" and "This Boy" on Granada TV's Late Scene Extra 27 November 1963, both guitars were employed. In a video clip from 1976 of George Harrison watching the Late Scene Extra performance of "This Boy", George bursts out, "I gave that guitar away"! As we know that one of the guitars (actually Lennon's) is still in the Harrison collection of guitars now owned by George's son Dhani, George must have given his own away and kept Lennon's. The once Beatle-owned J160E Gibson guitar is currently on a tour of being displayed at various places before it will be auctioned off at Julien’s Auctions Icons & Idols Rock n’ Roll Auction event to be held on November 6th & 7th, 2015. How can Dhani let this guitar beeing auctioned?? It was already known that John and George had switched guitars at one point. The 'stolen' guitar was George's and George had John's. Dhani isn't auctioning his guitar - that is the one that was still in the possession of the Beatles after late-1963. The sale is for the one that George says he gave away (or got stolen) in late-63. George carried on playing the guitar that was left (although John still used it occasionally, as in Hard Days Night) and John got a new model in September 1964. When this whole affair of the guitar began surfacing began a few months ago, I remembered clearly having read in a book years and years ago, about the guitar having been stolen. The story was that it had happened after a gig in the States were on a sudden moment John said to Mal Evans "Where is Jumbo"? And that subsequently Mal was scolded by John for letting it get stolen. I'm breaking my brain in thinking what book it was. Having commented on this issue a lot already I was determined to lay low, but I feel duty bound to help you out, Hugh. The story first appeared in Hunter Davies' authorised biography in 1968. It was the section introducing Mal Evans' role with the Beatles (page 183 of the first edition) and Evans' confirmed that the guitar went missing in the Astoria Cinema, Finsbury London. Thanks to Lewishom we now know that the Beatles played a series of Christmas shows at this venue between the 24th and 31st of December 1963. Thanks to Babiuk, who tracked down the receipts, we also know that somewhere down the line the ownership of the guitars got switched so that George ended up with John's guitar. Since then the missing guitar, unquestionably the same one, has turned up for auction. The serial number and wood grain patterns establish this is the correct guitar beyond doubt. It is known that George gave away a lot of his guitars, but whatever he says in the clip, there is no doubt that John lost a guitar (originally registered to George)and that this guitar has now turned up. George might have been mistaken with other guitars he gave away, and I think it highly unlikely he gave a valuable guitar away in 1963. Besides, Babiuk's research showed that even in 1962 the Beatles were still buying things of HP and that the guitar bill wasn't settled until late 63. The equivalent price of each guitar, specially ordered from the US, was around £2k in 2004. Given the special order, the cost and recently settled bill, is it credible that George gave one of these away?